A mother's love knows no species boundaries. 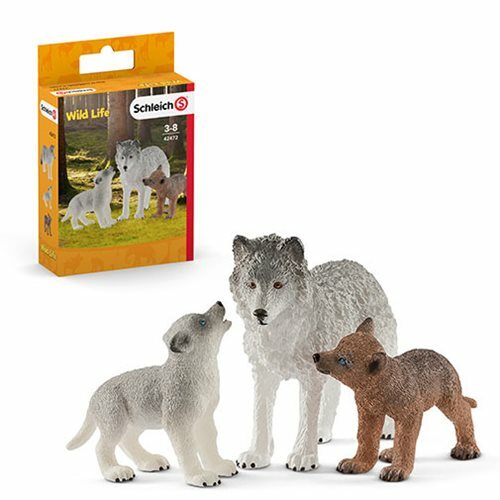 The Wild Life Mother Wolf with Pups Set features mama and her two offspring in amazing detail and authenticity! She measures about 5 1/3-inches tall x 3 1/2-inches long. Ages 3 to 8. For even more fun, collect and play with all the finely detailed Schleich Wild Life playsets and figures. They encourage children to play and learn at the same time! Each sold separately. Wolf pups are blind and deaf at birth and therefore dependent upon their mother. Only after two weeks do they first open their eyes, and after about ten weeks, they begin to explore the world around them. The little rascals like to play hide-and-seek, roll around in the grass, and hunt small insects. However, as soon as they're two years old, they leave the pack to start one of their own.